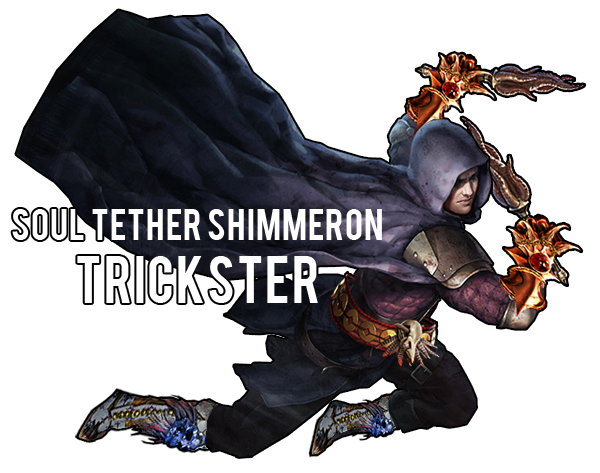 This is a Trickster build that utilises a combination of Soul Tether, Atziri’s Acuity and two Shimmerons for a large pool of effective health, slayer leech, and a respectable amount of damage. Shimmeron has lost quite a bit of popularity ever since the change to its degeneration mechanic, but it remains as a very powerful wand, provided you can deal with its downside. Vaal Pact life leech recovering Energy Shield via Soul Tether in addition to the separate leech cap from Energy Shield leech allows us to counter the degen more than comfortably. I went with Storm Brand as my main skill, but with some tweaks, other skills will work just as well. -Exchanged Efficacy support in the Storm Burst 4 link with a Vaal RF as the support wasn't too useful and VRF is a free damage boost. -Added a Watcher's Eye to the build. -Changed the visual style of the guide. -Changed the structure of the guide. -Added a proper ascendancy section. -Rewrote the gearing section, with new min-max options. -Rewrote the build core section to include more information on the main mechanics. The cost of the build is effectively dictated by the popularity of Atziri’s Acuity at any certain time, which due to the nerf to Slayer leech is not very high as of now. The rest of the core (Soul Tether, Shimmerons) are single digit chaos items, and the rares aren't too expensive either. That isn't to say that there isn't min-maxing potential, as especially with the addition of Synthesis crafting, some insanely powerful items can be created to push this build even further. The main use of this node is the immense amount of damage it gives us. The mod "Gain a Power or Frenzy Charge each second while Channelling" also allows us to use a channelling skill to ramp up to full charges before a boss fight, and the Frenzy charge generation means we don't have to use Blood Rage for that while mapping. The "3% reduced Damage taken per Ghost Shroud" mod gives us a lot of defense, not to mention that it also lowers the degen from Shimmeron. Unfortunately our Evasion Rating is not very high to take advantage of the recovery when Hit. Even if the node only gave us the 36% Attack and Cast Speed it would be well worth taking, but it additionally gives us 20% Spell Dodge and a bunch of Energy Shield and Evasion Rating. Absolute monster of a node. Smooth mapping: the node. The recovery on Kill and increased Recovery Rate make it seriously difficult for us to die while mapping. The increased Recovery Rate can also be triggered during boss fights by using The Writhing Jar, seriously boosting the amount that we leech. We do need Added Fire damage somewhere on our build to be able to ignite enemies. Convenient sources include our boots (Doryani's Delusion) or an Abyss Jewel with Added Fire damage to Spells. For Ascendancy progression I'd recommend Swift Killer – Ghost Dance – Escape Artist – Patient Reaper. Patient Reaper will make mapping very smooth, but I don’t think it is necessary to start off, and the damage from Swift Killer / survivability + damage combo from Escape Artist is just too much to give up. In any case, I’d try to get Uber Lab done as soon as possible. These wands are the main damage source of the build. In addition to providing a ton of damage, the 28% total Spell Block (since we have 7 Power Charges) they give us is quite a significant defensive boost. At capped Lightning Resistance, the wands cause us to degenerate for 700 health a second, or 560 with a Topaz flask. Additionally, the reduced damage taken from Trickster's Ghost Shrouds also applies to this degen, causing the degen to be 509.6 with all three up. For a couple of Chaos Orbs, you can’t beat these in price/performance ratio. To make countering the Shimmerons' degen easier, the build uses Atziri's Acuity for its Vaal Pact. Pathing to Vaal Pact is really not an option since we also need to travel to the Templar area for Runebinder, making the gloves a perfect fit. You could use the “You have Vaal Pact while Focussed” craft on an amulet instead, but since it only has 33% uptime (Focus lasts 4 seconds, with a cooldown of 12), I'd rather use Acuity. Vaal Pact, however, only applies to Life Leech, while around half of our effective health pool is Energy Shield. This is where Soul Tether comes in. The mod “Life Leech effects Recover Energy Shield instead while on Full Life” allows our Life Leech, Vaal Pact included, to apply to our total amount of Energy Shield leeched. This means that we are leeching for 40% (20% base + 20% from Vaal Pact) of our maximum Life and 10% of our maximum Energy Shield a second as Energy Shield. The maximum Life portion is further be augmented by using an Elder amulet, and the recovery in general is augmented by Trickster's Patient Reaper. With all of this taken into account, my character is leeching for 4458 Energy Shield a second, almost half of the total pool of 9256 effective health. Thanks to the mod “Life Leech effects are not removed at Full Life”, we possess the incredible power of Slayer leech. This mod applies to Energy Shield as well, because Soul Tether makes our Life Leech apply to Energy Shield, rather than straight up converting it into Energy Shield leech. It is worth noting that the natural Energy Shield leech will end at full Energy Shield, so technically we lose out on a slight amount of leech (839 in my case). Whether this means that we can double dip on Energy Leech support’s “24% more Damage while on Full Energy Shield” and “39% more Damage while Leeching Energy Shield”, similar to how you can have the benefit of Damage on Full Life while using Blood Rage, is unclear. According to Rory, both damage modifiers cannot be active at the same time, so I'll take his word for it. The item also has the mod “Your Energy Shield starts at zero”, which isn’t an issue, as thanks to our leech and Patient Reaper recovery on kill we go up to maximum Energy Shield almost instantly. It does make lab pretty much impossible tough, but more on that later. The last two mods, which prevent us from Recharging or Regenerating, mean that Vaal Discipline and Zealot’s Oath do nothing for us, not that we could use Zealot’s Oath with Vaal Pact anyway. The implicit on Soul Tether is garbage, so you can go for whatever corruption implicit you feel like. I'd recommend checking out the Wiki for a list of possible belt corruptions and picking what suits your needs the best. Because Trickster's Escape Artist makes the Evasion Rating on our body armour give us Energy Shield, the best bases to craft on are Sadist Garbs or Carnal Armours. Sadist Garbs come out on top very slightly, but are also harder to colour due to their higher Dexterity requirement. We want the body armour to have a high tier EV/ES hybrid roll alongside a high life roll. You can go for either flat and % hybrid rolls and a life roll, or a flat/% hybrid roll, a life roll and the crafted mod “Gain 10% of Maximum Life as Extra Maximum Energy Shield”. No matter which option you go for, I wouldn't skip the life roll, as the majority of our leech uses our life pool as the base for the amount that we leech for. Two tier 1 hybrid rolls wins vs. the crafted Maximum Life as Extra Maximum Energy Shield mod on my setup, but the crafted Maximum Life as Extra Maximum Energy Shield wins against crafted hybrid EV/ES. Traditionally, you couldn't use Dense or Pristine fossils to craft a chest like this, because they cancel out one of the desired mods (Dense cancels life rolls, Pristine cancels ES/EV rolls). However, thanks to Synthesis league's fractured mods, you can now use a Dense fossil on a chest piece with a fractured life roll, or a Pristine fossil on a chest with fractured hybrid EV/ES rolls. Definitely recommend going this route if you're not on a budget. However, if you are on a budget, I can recommend purchasing a 6-link base and then crafting the chest piece yourself. Essences of Greed can get you started, or you can simply Chaos spam until you get something workable. My Pandemonium Hide cost me a total of around 60 chaos to make, the price of the base 6-link included. Trickster's Escape Artist gives us Evasion Rating based on our helmet's Energy Shield, which is why the Hubris Circlet is the best choice here. It is also a popular choice for Labyrinth enchanting, so getting the enchant that we want is going to be easier than on a more obscure base. We want to have a high Life roll and two high tier Energy Shield prefixes. Ideally, we'd also have either the Delve Life suffix, Energy Shield suffix and/or the -9 Lightning resistance suffix. Additionally, we want to have the Storm Brand penetration enchant, as that gives us a good chunk of damage. Crafting the helmet is a bit trickier than the chest. Here, our choice is between a fractured mod for high combined Life and Energy Shield rolls, a pre-enchanted base that is a bit more difficult to craft, and a Synthesised base with +1 Power Charge for the ultimate min-maxing. I chose to go with a pre-enchanted helmet which I got for 50 Chaos. I then used Essences of Woe on it and landed with Gale Horn. It is far from perfect, but since it had a good amount of resistances, I decided to stick with it. We want the ES base since this is a hybrid build. For the added damage, we’re going to want either Fire damage (recommended) or Lightning damage. The reason we want Fire damage is that we need a source of Fire damage somewhere in our build to be able to ignite and trigger both Cinderswallow and Patient Reaper. If you have a Hypnotic Eye Jewel with Fire damage to spells, you can opt to go for the Lightning damage instead. The Purity doesn’t really matter, though theoretically you might be able to get enough reduced reservation to run Purity of Lightning and therefore take less damage from your Shimmerons. I wouldn’t worry about it though. For your boot enchant, I’d recommend penetration, cast speed, movement speed or leech (for hexproof maps). A pair of rare boots with Onslaught or other good Synthesis implicits and an Abyssal Socket is the min-max goal here. A Maximum total Recovery per second from Life Leech elder amulet is really nice here, as it gets doubled by Vaal Pact. After the Slayer leech nerf these seem to be going for very cheap as well. For the other stats, I’d prioritise maximum Life and resists as well as Critical Strike Multiplier if you want more damage. Since we're working with an Elder base, the non-Chaos as Extra Chaos mod would be ideal for a min-maxed setup. An Elder Warlord’s Mark on hit ring is our source of Life Leech for the build. Try to get some maximum Life and whatever resistances you’re missing on it if possible. If you can’t afford one right now, you can drop either Discipline or Wrath (depending if you feel you’re lacking damage or survivability) for a Blasphemy setup. If your resists and budget allow for it, an Opal Ring base is great for damage. Mark of the Shaper pairs nicely with the Warlord’s Mark on hit ring and isn’t too expensive. If you’re worried about corpse destruction, you can use a Pyre as a ring swap for Mark of the Shaper when Delving. Remember that this might change your Wise Oak Lightning Penetration if your Cold and Fire overtake your Lightning resistance. Alternatively, Call of the Brotherhood might give you enough cold damage to shatter enemies, but you lose out on a lot of the benefit of Lightning Penetration, and may need to shuffle your setup around to accommodate. A Synthesis explosion implicit wand may also be an option worth considering, though the mods on it will have to be nearly perfect to match a Shimmeron. The Writhing Jar can be used to trigger Patient Reaper during boss fights that don’t have additional trash enemies. Feel free to replace this with a flask of your choice. Atziri’s Promise is a good option for a bit of survivability against chaos as well as some more damage. Since The Writhing Jar is not giving us any utility mods, an Adrenaline Quicksilver can be slotted in to help with clear speed. Bottled Faith is incredible for offense if you’ve got the currency for it. Diamond Flask is obviously great since we’re a crit build. Get either Freeze removal or Curse removal here. Cinderswallow Urn is a fantastic damage flask that also provides a mini-Patient Reaper effect. For the veiled mod, I’d recommend movement speed or critical strike chance. The leech mod that I have is not too noticeable. Worth noting that the movement speed veiled mod does not stack with Adrenaline. Try to get Lightning resistance as your highest resistance for the Lightning penetration. Triple balanced is also great for defense, but not necessary, and would mean that you can’t reasonably use a Topaz flask. Weakens the Shimmeron degen. You can replace this with a utility flask of your choice, such as a Quicksilver flask if you want to go faster. Just make sure you have both Freeze and Curse removal on your flasks somewhere. Get one Jewel with “Corrupted Blood cannot be inflicted on you”, as this saves us a flask slot. Regular bleeds don’t really hurt us too much thanks to our immense leech, but if you’re feeling unsafe, a Staunching flask is not a bad option either as it does allow you to get a better Jewel (for much cheaper anyway). As for the rest of the jewels, look for Critical Strike Multiplier, Cast Speed, Lightning/Spell/Generic Damage as well as Life/Energy Shield at a ratio you feel comfortable at. You can also get flat fire damage to spells here if you want to use a pair of rare boots instead of Doryani’s Delusion. A Watcher's Eye provides a nice balance of defense and offense, but can be very expensive. I'd recommend Wrath Penetration. Remember to change from Standard to whatever league you’re playing! If you have to run a 5-link, I’d drop Lightning Penetration. Power Charge On Critical is for comfortable Power Charge sustain on boss fights, and it gives us a decent amount of damage anyway. This 4-link is used for generating charges pre-boss fights, for the Infusion buff from Infused Channelling, which gives us 10% more Lightning damage, and the 28% more Spell damage from Vaal Righteous Fire. Increased Duration affects the duration of both Infusion and Vaal Righteous Fire. Remember to keep Storm Burst at level 1 to minimize the mana cost! Wave of Conviction applies -25% Lightning Resistance and putting it in a Cast when Damage Taken setup is convenient. Remember not to over-level your skill gems or they won’t be triggered! Increased Duration can (and should be) level 20. Increased Duration affects both the Immortal Call and the Wave of Conviction duration. Level 7 Arcane Surge will activate every time you use Flame Dash. You can add an Empower to get a lower cooldown on your Flame Dash, which also raises the mana cost enough for you to use a level 8 Arcane Surge. Alternatively, you can put a Portal in here. You’re spamming Brand Recall often enough to have a full uptime even on a level 8 Arcane Surge. Empower reduces the cooldown of Brand Recall. You can add an Enlighten here for some more quality of life thanks to a bigger mana pool. If you’re running Blasphemy Warlord’s Mark instead of a Warlord’s Mark on Hit ring, replace Enlighten and whichever aura you feel you need less. We’re siding with Alira for bandits. No two passive points on the tree could give us as much bang for our buck, though there is an argument to be made for a three-point Jewel socket at higher levels. Most of the Pantheon choices are valid for this build. I’ve gone with Soul of Solaris for my Major Pantheon for the 8% reduced Elemental Damage taken and no Extra Damage from Critical Strikes, but have also been running Soul of Lunaris occasionally for the movement speed and Dodge chance. For the Minor Pantheon, I’ve chosen Soul of Shakari, as I don’t have too much Chaos resistance and the Poison immunity is quite nice. Soul of Arakaali’s 50% increased Recovery Rate if you’ve stopped taking Damage Over Time Recently is unfortunately unable to be triggered consistently, as we don’t have a way of stopping the lightning degen from Shimmeron. However, the 5% reduced Damage taken from Damage Over time should still work to lower the Shimmeron degen, and the +25% Chaos Resistance isn’t insignificant, so there is still some value in picking this Pantheon. -Since we’re relying on Warlord’s Mark for our leech, Hexproof maps are a no-go unless you have the leech boot enchant. -If the map has “Cannot Leech” in general, then we’re out of luck. -Minus max res and reduced recovery rate, as -max res makes us take more damage from Shimmeron degen, and reduced recovery rate makes our leech less effective. There are no problems if just one of these is present. You can channel your Storm Burst for 0.6 seconds (at 20/20 Infused Channelling) to get Infusion, which lasts for 12 seconds. I’d recommend doing this before bosses and other tougher encounters. If you don’t have your charges up for a fight, you can also channel Storm Burst to regain them. Since Storm Burst is level 1, you should be able to channel it without losing any mana thanks to our mana regen. -Unequip your Soul Tether. The lab traps do damage based on your combined HP pool, but you’re likely not going to have any ES while going through traps, effectively making the traps deal double damage. -Get a different pair of weapons for labs in general. Shimmeron degen + lab traps = death. There’s not going to be anything to leech off of during the rippy trap segments, so you’re just causing yourself more trouble by using them. It’s very easy to accidentally trigger the degen by critting one of the Sentinel traps with a Flame Dash. The damage is going to be enough for clearing lab anyway, and if you don’t want to spend too much money on a spare pair of wands, you can always keep your Shimmerons on weapon swap for Izaro. If you want to be extra careful, use a life flask with Soul of Ryslatha minor Pantheon, which passively recharges your life flask charges. I’d suggest starting with a generic Storm Brand Trickster and transitioning to this one once you have enough currency to get an Atziri’s Acuity. I personally switched to this setup past level 90, but you can do it as early as level 70 without issue. Storm Brand itself is incredible for levelling and can already be equipped by the end of Act 1. You can’t get it as a Shadow however, so you’re going to need to buy one on another character. You can use whatever skill you like until you get the gem and then just cruise through the acts. For your passive tree, rush to Runebinder taking whatever life nodes are on the way. I wouldn’t recommend switching to Shimmerons until you have Atziri’s Acuity. Before that, you can run some generic spell / crit multi wands with Soul Tether. I’d also skip taking Power Charge nodes on the tree until you’re using Shimmerons, so take that into account if you’re looking at the level 70 tree. I apologise if this levelling section is inadequate. I'll update this to be a bit more thorough if I start with the build in a future league. Thanks for checking out the guide. If you have any questions or suggestions for improving the guide or the build, let me know. Guild mate here. Seen the build in action. Can recommend! Nice build. Trickster and Soul Tether are a great combo. looks amazing. just got into maps with your build. still missing uber lab but it plays smooth. Nice build. Those changes to ES leech wanna make me play path of exile again! Now that you can fossil craft on Fractured items, the opportunities for chest and helmet crafting have opened up. I'm still yet to find a Cortex this league, but I'll try to record the kill once I do find my first one to showcase how this build does against that content. I see you're trying out Winter Orb. Any good? I'm thinking of trying a few different spells as well, Storm Call is looking pretty interesting.